When we held my father Rudell's funeral service in the Monument cemetery, raging forest fires surrounded the town, and we could hear the burning wood crackle. Smoke filled the air, and through stinging eyes, I could see only about a hundred feet. Ormand, my half brother, set the box containing my father's ashes next to the headstone. He kept looking around, but neither of Rudell's former wives had made the effort to attend. My half sisters didn't show, either. Just us boys. As Ormand read the Bible parable of the workers in the vineyard, I stood off a ways, since it was Ormand who grew up with my dad, not me. As far as I was concerned, this was Ormand's show. Anyway, he was an apprentice preacher, and this was his first funeral. Besides, I didn't want to stand too close because one of the Lesley bad luck demons might crawl into my bones. Ponderosa, lodgepole, red pine, juniper, sagebrush—all burning. The wind carried the smell like a campfire, but bigger and more ominous. The Forest Service had sent 450 firefighters into Monument and they had taken over the whole town, except the cemetery. Mexicans, Indians, Alaskans, prisoners with crew cuts and jug—ears guys who hadn't seen anything outside but brick walls and razor wire in years. None of them could do a thing with the fire because of the wind. They sat around, dirty and defeated, complaining about the wind shifts and lightning strikes. Nobody could handle that fire. The wind gusts topped thirty miles an hour and the blazing embers touched off spot fires everywhere—in the canyons, on the scablands, the far hillsides. Johnnycake Mountain was burning, and the Boneyard, Sunflower Flat, even Cupper Creek, where my dad claimed he saw Bigfoot back in 1980, when Mount St. Helens blew. He said old Bigfoot knew the blast was coming so the creature hightailed it four hundred miles away, into the Umatilla Forest near my father's fencebuilding camp. How it crossed the Columbia, he couldn't figure. Maybe it swam, or paid a bridge toll like everyone else. Ormand swears my father didn't meddle with the truth, but I've always been skeptical. The old man ran off and left my mom before I grew teeth, so I didn't owe him anything, not even the benefit of believing his wild stories. Right then, Ormand kept droning on about the vineyard workers who never started until an hour before quitting time. Even so, they got paid for a full day's wage, and the other workers complained that the latecomers got the same pay for less work. My feet were wet because some yahoo had turned the sprinklers on in the wrong part of the cemetery and flooded the section where we held the service. They could have used that water on the fire lines, I figured, but I was wet-footed instead. Maybe it would soak into the wooden box that held my father's ashes and make a soggy mess for us to scatter. And I thought Ormand made an okay preacher, the way his voice kept getting low and serious when he was making a point about how my father had come to believe late in his life—at the eleventh hour—but he was still saved, paid the same wages as those who had started laboring in the vineyards early in the morning. My half brother was thinking about studying preaching at a little Bible-thumping school over near Boise. And I smiled just a hint, wondering if Ormand would give up poaching deer and elk when he starting preaching for serious full-time, and small-town people criticized his every move. 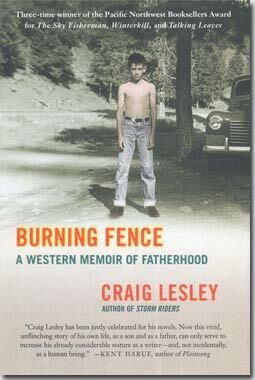 But I was thinking hardest about something else: all the range fences my father had built in his lifetime. Each post split and fashioned from ornery juniper was burning now, and as the posts burned and the barbed wire sagged, frantic horses and cows ran helter skelter all over the mountainside and up the canyons, ran until they tangled in wire and dropped, rolling their panicked eyes and frothing at the mouths as the fire blazed toward them. And then I thought about Ormand helping my father build most of those fences, flunking out of school while my father used him like a horse, packing posts and wire spools, sledges and post, hole diggers. My brother was all crippled up from that wretched work and being smacked by a car when he was eleven while walking out of the Irrigon hardware store. He should have been in school, but he was a huge, rawboned boy capable of a man's work, and my father took advantage. "Long-suffering," my uncle Oscar called my father and his brood. And it was true. Opal didn't make the funeral because we couldn't find her. Yuba-Jean was slaving as a motel maid down in Weed. None of us was young anymore. All of us had snuck past fifty when the devil wasn't looking. So I was thinking about all this, mostly those miles of burning fence line, when Ormand banged his Bible shut. Everyone seemed satisfied, except for me. I know that Ormand said God had forgiven Rudell, but I hadn't. My mother seldom mentioned my father—coyote trapper, fence builder, backslider. She believed in keeping quiet if she couldn't find anything good to say. "Weak as water," or "That loser," she let slip a couple of times when I was growing up. Then she hastened to add, "But there wasn't a mean bone in his body." Of course, that was wrong. "Shell-shocked," "not good in his mind," "no-count," other relatives suggested over the years, and they were on his side of the family. When I first workshopped with Raymond Carver and showed him stories with a character similar to Rudell, Ray called him "shiftless." Then he crinkled a smile. "Or still working up to it." If anybody asked, I told them my father was in the fur business. My mother claimed he worked as a security guard at the Umatilla Army Depot, where the army stored thousands of tons of chemical weapons. This suggested that he served an important role keeping the U.S. safe from the evildoers of the world. True, he did work a spell as a security guard, but long after she was married to him, when he tried to maintain a second family. Eventually, his other wife took my four half siblings and ran off to California with a long haul trucker. After that blow, my father claimed his nerves were shot, and he collected a small government disability check. Moving back to Monument, he tacked a lean to shed onto a banged-up trailer and started trapping coyotes and poaching deer. "Oregon Appalachia," my mother called it. My birth certificate is the only official document I have that holds Rudell's scrawled signature and birth date: March 18, 1914. Ormand has my father's discharge papers from the service. Rudell served with distinction in France and faced severe fighting in the Battle of the Bulge and the Ruhr Pocket. He received several medals and an honorable discharge after fighting the Germans all the way to Berlin. I was born on July 5, 1945, and my father left eight months after that with what my mother called "shell shock." My mother raised me, providing groceries, shelter, discount shoes, and most important, unconditional love. She believed in my success and encouraged me to attend college. So why write about my father at all when she's the hero? Even though I had only eight meetings with my father until I was well past forty, his influence on me was enormous. Since my mother had criticized him for being "weak," I vowed to be strong. Fear of backsliding motivated me to become high school and college student body presidents, to keep moving ahead at all costs. This also fueled my obsession with becoming a writer and chronicling the lives of Westerners similar to my father. Rudell's neglect motivated me to raise an alcohol-damaged Indian boy just to show the old man I could succeed as a father where he had fallen down. To be truthful, it was harder than I thought. I stood trapped middle ground between a man who wouldn't communicate and a boy who couldn't. Tricky business, fathers and sons. In my case, a lot needed settling.